 I guess that by now most of you will have done the math and concluded that the answer to the "teaser" in the title isn't "12" With Team Mission8 just having made its entry for the 2019 DiSCA Oxygen Le Mans 24hrs it is time to reveal the ultimate goal for this W.I.P to build the two BMW M6 cars... and that is to build and race BMW's latest ultimate GT.... the M8 GTE. Its a big project (and I'm not just referring to the M8's size) to big for just one person to complete. Design work on the 3D model is already at an advanced stage with the first Master print due by late November. 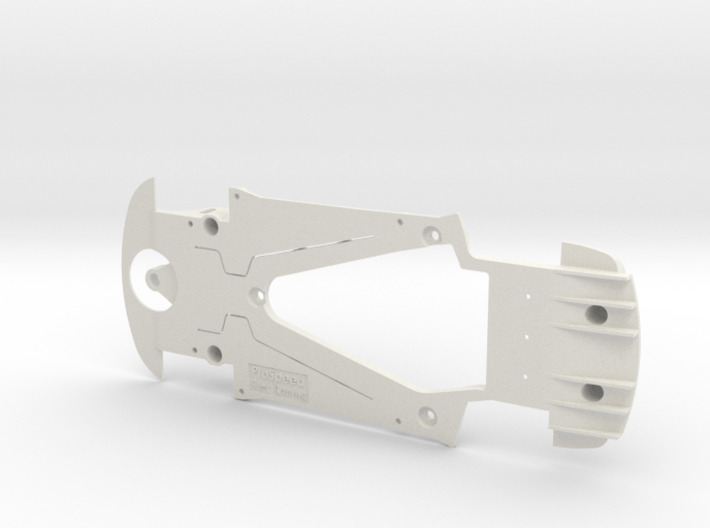 3DP Chassis design and development already in full swing in cooperation with ProSpeed. Decals and hopefully milled aluminium 5 spoke BBS wheels by Slotfabrik. Full light set by Z-machine etc etc. First debut planned @ the Suzuka WEC race in Best, NL on Jan 27th 2019. No, not at this stage, the 11,9 gr as you can see in the picture, was for the bare body only. Windows, wing and detail parts will add another 6,8 gram. As for the decal tutorial, the NSr C6 Corvette topic on Slotforum did cover the steps on how to make decals but I'll think about it. Excellent Tamar. 11.9 including the all the windows and small parts? I was wondering if you were going for the stock Carrera Stars&Stripes livery. Ah, on another note: would be possible for you to make a step-by-step tutorial on how to make your own decals (from design to print) using your fav editing software? I know that you have done one for the NSR corvette, but that was covering mainly your technique to convert the body from 3D to 2D. Maybe not for this car, but as an idea for a future tutorial. Hello Guys. Here's an update on how I put my Carrera M6 on a Diet. As with all weight loss programs...if you need to loose some fat, its a case of shedding tiny bits of weight when ever you can, where ever you can...although in some areas it was more like performing an outright liposuction. My preferred tools in such matters...the rounded #22 X-acto blade and these Dremel bits. The thing you want to avoid here is...heat. The way to do so is to keep the revs low and your finger on the trigger, meaning place one of your fingers on the "other side" of the surface you're working on. If it gets too hot for your finger it will certainly be too hot for the plastic. Although the benefits of reducing the total weight of the body will be obvious, lowering the centre of gravity is more important than lowering the overall weight. Which is why I like to take things step by step, and as a rule start working from the top down. So on the bottom left you see the first and also the last big chunk you''ll be able to remove in one go" the weigth of the centre glass section. Next area to address are the roof, the window-frames and the B & C-pillars which in true Carrera style can about 2mm thick in some places. Good practice is always to follow the shape of the exterior as close as possible. Which is why I placed two pieces of masking tape on the roof as a guide line for the "high" areas. I've highlighted the areas where I removed most of the material on the pictures. As a rule of thumb, if you can reduce the wall thickness by 50% you should be able to reduce the weight by the same percentage...but practice does not follow theory by 100%. In some areas you need more material to maintain structural integrity...more so because this car will be raced digital. On the right you see that after doing the roof and hood the M6 tipped the scale @ 20gr. Doesn't seem like much, but this picture was taken with the windows and the vacformed (BMW M3 DTM) interior. So the actual weight reduction on the bare body was more like 4gr. Next up was trimming the one piece head/foglight cluster. There have been cars where Carrera used the center section for the front grille. Luckily for the M6 this is not the case so the whole section went in the bin. Trimmed the light clusters as close as possible (test fit- remove material- test fit again) and dumped the foglights into 90% isopropyl alcohol. Too bad the guys in the factory had managed to nudge the left foglight with their soldering iron as they hot melted the dive plates. I did one more thing to reduce the weight of the clear parts, but this one is not for the faint hearted and should only be done if you're confident that you'll be able to succeed.!! On the M6 its not only the body that is extremely thick, the windows are as well. After cutting away the center section there's no material left to trim, so there's but one way to reduce their weight and that is to sand them down and make them thinner. The stock side windows weight 1,2 gr, the rear window 1,2gr, the front windscreen 1,9gr . So by applying the 50% rule there's a potential 2,1 gr to be gained here..well worth the effort. To do so you'd best stick a fresh and sharp blade in your x-acto holder. Tape up the outside of the windows and carefully start scraping material away from the inside. For the narrow side windows its best to do this with horizontal strokes. For the more square rear window cross hatching will give the best results. The trick here is to avoid deep scratches, so after several passes, clean up the surface with some 1200 grit wet&dry. Repeat the process until the scale tells you you're at 55- 60% of the stock weight. Then start cleaning up the surface with 1200/2000 and finally 4000grit. If your personal stock doesn't go beyond 1200..sneak in to the missus bedroom and snag her nail polishing stick...if it can polish her nails...it will also polish your windows back to a near crystal clear shine. A last buffing with Johnson wax or Tamiya polishing compound will restore your windows to stock transparency. After trimming all clear and body parts there are no big lumps left to remove, so instead of whole grams, you'll have to look for area's where you can shave a few tenths off. Find five of those and you do have a gram less. Its as simple as that. You provide the elbow grease and sweat, she'll loose the pounds (or grams in 1/32). It took me 4 nights of dremmeling, scraping, sanding and polishing to get the bare body down to 12,4 gr. Not the 50% I'd hoped for, but good enough for her to take a bath in the 90% isopropyl alcohol. After two hours soaking and half an hour with a toothbrush I now had a 11,9 gr heavy Carrera white kit. Yes I noticed that the chassis is "temporarily" not for sale. When I build the Mark I version there was a slight misalignment issue with the NSR suspension screw holes. But when he printed the chassis on his own PLA printer and checked it on the chassis Jig Stefan had build for himself it all fitted. So Stefan wanted to have the Mark II SLS printed and checked at his workshop first before releasing it back for sale. Update: Stefan has put the M6 chassis in the "not for sale" category now...I do not know if they are going to print it or not now. Too bad Tamar: I have already put in the order (it is a multi-buyer order with other members of my analog club). I am ordering the nsr version without the front splitter and the slot.it version as well. Please tell Stefan that if these chassis are not the final versions, it would be better to put them in the "not for sale" category. Hello Gio, you'll be pleasantly surprised to see that the ProSpeed rear wing tips the scales at 0,8 gr. Maybe even less as the wing Stefan has in his shop right now is already the Mark II version (with the correct scale slots in the supports) as opposed to the Mark I that was a straight copy of the original (solid) Carrera wing supports. And I know that you can't wait to order stuff...but I would advise you to have a little bit more patience. There will be some more modifications made to the M6 chassis, these are still Beta versions. A def version will be uploaded for DISCA GT3 homologation by end of this month. Last but not least...yes getting the M6 body down to a competitive weight will require copious amounts of elbow grease. But spread it over several days..and it ain't half as bad. I have ordered a 3d rear wing from pro-speed. That should help in reducing some weight and have a durable wing. Good to know about the M3 interior. I hope that the one from Slot.it is also big enough. So we need to drop 10 gr from this body, eh? That is a lot of work. I remember spending hours with the bentley to shave off plastic. True, 20.9 for the bare body isn't that bad for such a big car, but it still needs to loose almost half its weight. Windows are very thick and heavy, Rear wing almost 2 gr. Small details bits like mirrors etc account for just 1,3 gram. PRS has a vacformed M6 interior , hard to order parts from their site but I've tried. Pulled a Slot-Tec DTM M3 interior out of my Carrera M3 DTM and it fits. Actually, 20.9 gr as a starting point for the body only is not that bad. I can't believe that 10 gr come from the windows, wing, and front grill details. What ideas do you have for the interiors? I have ordered a lexan interior for the DTM M3 and will see if it fits in the M6. So I picked up a brand new analoge Stars&stripes RLL M6 GTLM for €30. Which is about the same money you'd have to part with when acquiring a Scaleauto or Slot.it white bodykit. Undo the 4 Philips screws to separate the body from the chassis and you can start carefully cut away the excess melted plastic that keeps all the detail parts attached to the Body. The first step will be to remove the tray interior, there are 6 mounting tabs which are easily identifiable. My preferred method to remove the excess molten plastic is by using a rounded X-acto knife. 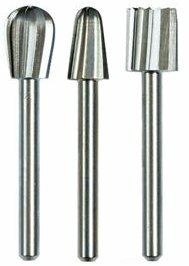 These are sharp enough to cut plastic and strong enough to pry parts loose. With the interior removed you can now acces the 4 retaining tabs that keep the one piece front and rear window section firmly stuck to the roof. Here you'll have trouble removing the plastic with a knife (and using one might also risk scratching the windows) so this is the first opportunity to use your Dremel. Carefully mill the excess plastic away until your flush with the clear center section. The same can be done with the retaining tabs in the B-pilars for the side windows. Use a Philips screw driver to pop these tabs out of the B-pillar..with care. You don't want to break them. Once free from the B-pillar you can fold the side windows forward and "un hinge" them from the body. Next step would be to detach the rear bumper from the body, Knife works best here, remove as little material as needed to pry the bumper off. After all weight reductions have been done you want to be able to "melt" the bumper securely to the body again. With the Bumper off, acces to the taillight lenses is a lot better. There too, take care to remove the minimum of "melted" material. Start on the outer tabs of the lenses first. If you can pop these out, the lens "un hinges" itself from the inner tabs. The one piece headlight/Foglight cluster is the last big piece to dismount. Removing the melted material is a bit tricky here as the two tabs for each headlight cluster are very close to the clusters themselves. Again the rounded x-acto blade is your best tool here as any slip-up with the Dremel will damage the clusters. To dismount the part from the body carefully slide your X-acto blade between the foglight clusters and the body splitter. The fog lights need to be pushed inward for them to "pop" out of their surroundings. Once they are free you can carefully "wiggle" the whole piece down. So there you have it all parts removed and a Bare Body of 20,9 gr to start with and a lot of detail bits and pieces. Last tip in this post is one from Sweden. When ever I start a new project I use one of Ikea's "Glis" boxes to store and keep track of all the bits and pieces. At less than €4 one of the best "Tools" for slot racing. Yes the car BMW now uses in GTE is the M8, its predecessor was the M6 GT-LM. My first (active) post here. Looking forward to this build. I vaguely remember that discussion about not racing a carrera car against more competitive brands. Was I saying that? 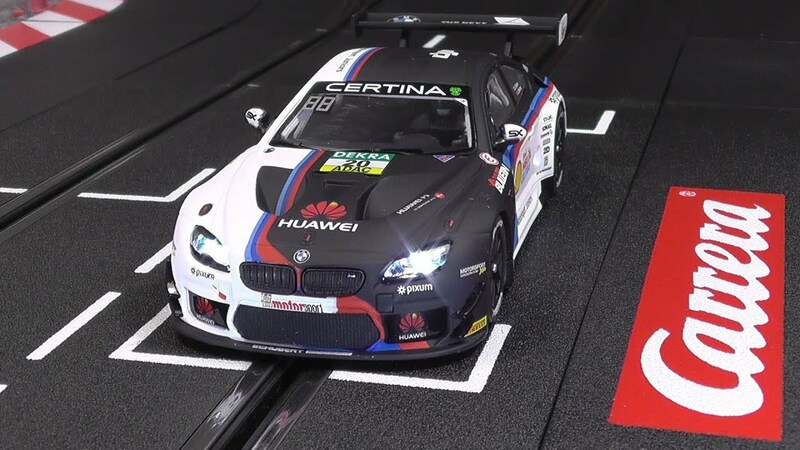 About the 1:1 scale car: I thought that BMW are using the M8 for GTLM. In 2016, the BMW M6 GT3 replaced the BMW Z4 GT3, which had been in action around the world since 2010. Since then, the BmW M6 GT3 has been the top model in BMW Motorsport’s customer racing range. The car is powered by a 4.4-litre V8 engine with M TwinPower Turbo technology. The power train has dry sump lubrication and generates up to 585 hp – with the whole car weighing less than 1,300 kilograms. The car won the Spa-Francorchamps 24 Hours in its very first season. Other technical features are the transaxle drive concept, a sequential six-speed racing gearbox, and powerful motorsport electronics. BMW Motorsport released an extensive Evo package for this car for 2018. The GTLM version is nearly identical to the GT3. Most specific differences are GTE rule driven. The other difference in tires comes from the manufacturers themselves, as BMW Team RLL works with Michelin in GTLM and Continental Tire is the exclusive provider for the IMSA GTD class (open for FIA GT3). There’s also a slight difference in aero between the cars, with the GT3 variant having two front dive planes, compared to one on the GTLM. Also, the GTLM car does not have a decklid spoiler. "Nobody in his right mind will ever enter a Carrera (BMW M6) car in a major multi brand competition". Off course I had to disagree with him, even though from his point of view he was absolutely right. If such a set of rules were to proscribe "Stock bodies and chassis" all Carrera cars would have absolutely no chance what so ever. They would not be moving chicanes, they would be the concrete guardrails for the Black Arrows, NSR, Scaleauto and Slot.it cars to crash into. Luckily the rules my M6 will be build to give me plenty of room to take a stock Carrera and turn it into a competitive slot car. So far so good, the Carrera slot car is pretty damm good to scale. So what's the problem? Why did the respected slotracer deem the Carrera cars as so "uncompetitive"? Well first of all one should know that if raced against its peers (as in other Carrera cars) the M6 is pretty good. Yes its a big lump of a car, but along comes a long wheelbase to even out the performance against lets say a BMW Z4 or a Porsche 911 GT3 RS. The same goes for the chassis, maybe not top notch compared to the "competition brands" but the chassis is straight & square, has steel axles with brass bearings, nice wheels (plastic) and grippy tires. With the advent of 3D chassis that are now widely available, upgrading a Carrera, Scalex or Fly car with a "competition" orientated chassis has become a much easier job...For the M6 I will use the ProSpeed chassis designed by Stefan Nalbach (D). Its a straight swap over, the chassis I picked is suited for an NSR pod and will be loaded to the hilt with comp parts. The main problem with getting a Carrera car on even footage with the "competition" is body mass. Carrera cars are well detailed, well build, but very, very heavy. It almost looks like they also wanted to recreate scale weight. BMW lists the M6 GT weight as less than 1300kg (without driver) scaled down to 1/32 that would be 40kg. Ok maybe not true scale weight, but still, the Carrera M6 tips the scales at 113 gr of which 42gr is made up by the body!!!!! So this is where the first focus on this build will be..to become competitive with its 1/32nd DiSCA GT3 competition peers..the M6 will have to follow a very strict diet. note: another racer on another forum kindly attended me to the fact that I had used the wrong formula to calculate the "scale weight"
"Weight will scale with volume so the correct divisor is 323 = 32,768 so the "scale" weight should be 0.04 kg or 40gr"